Blog vs Website – Which One Should I Choose? Last updated: Jan 30, 2019 . It’s no surprise that people struggle with these things. The whole blog vs website riddle can be confusing if you’ve never experimented with the topic before. In this short resource, I’ll show you exactly what the differences between blogs and websites are, how to decide which one you need, what the costs are, and how to make a blog or a website on your own and hassle-free. Blog vs website – what’s the difference? In this light, a blog is a type of website. If you go to your Chrome or Safari and enter any web address – like websitesetup.org – you’ll end up on a website. In fact, navigating anywhere at all from your web browser will land you on some kind of website. This means that Google is also a website, so is Facebook, and YouTube as well. Websites are identified by their domain names – aka. web addresses. As you can see, this website’s address is websitesetup.org. Facebook’s address is facebook.com and so on. Okay, so what’s the difference between blog vs website, specifically? 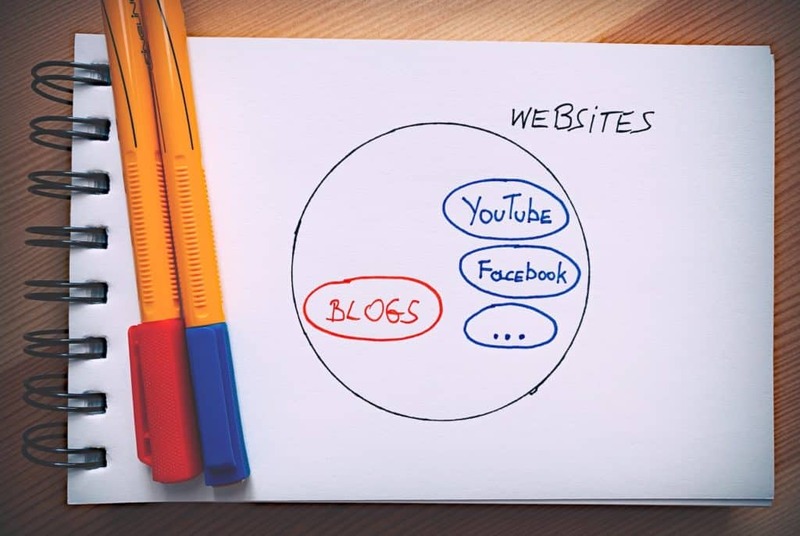 The graph above tells us that blogs are a subset of websites. This is somewhat like cars vs race cars. I mean, they all have four wheels and an engine, but the purpose of a race car is much more specific. Blogs are kind of like that. A blog is a type of website where the main focus is on prominently showcasing individual blog articles (called blog posts) by displaying them on the homepage of the blog in reverse chronological order (newest first). Though this might sound convoluted at first, the idea is very simple in practice. The goal is to make sure that whoever visits a blog, sees the most recent blog post at the very top of the homepage. The person who’s running the blog – be it a business owner or an individual – can share stories/news/articles that are the most relevant at a given time. With that being said, blogs are predominantly text-based. Meaning, the focus is on written articles more than on the visuals – such as images, etc. Blogs also run on what’s called a CMS (Content Management System). This is just a fancy name for a tool that enables you to edit your blog content similarly to how you’d do it in MS Word or Google Docs. This CMS makes managing your content easier since you don’t need any knowledge of web development or programming to take care of the blog effectively. On the other hand, if we look at a generic website, there’s no such requirement. Websites can present their content in whatever way. The content can also be anything, from text-only pages, to images, to videos, to products in an online store, and so on. Websites can use a CMS, too. But they can also use static, HTML-only documents built by a web developer. Before I help you tackle this question, let’s start somewhere else. In 2019, you really don’t need to think of “blog vs website” as either/or. The modern tools that we have at our disposal allow us to have both at the same time. The way to get that is to use a powerful website CMS, which will allow you to set up a blog as part of your website. So, at the end of the day, what you get is a functional website with blog functionality built in. For example, the most powerful and popular such CMS is called WordPress, and it’s actually what the website you’re reading right now uses. WordPress is free, open-source, and easy to use even for a beginner. It’s a blog engine by nature. WordPress started its life as a blog CMS. However, it has evolved into much more over the years. WordPress can power multiple types of websites, including blogs. At the time of writing, WordPress powers more than 30% of the entire web. Yes, that is correct, roughly one in every three websites on the web runs on WordPress! Just to recap; don’t think of this as having to choose between a blog or a website. 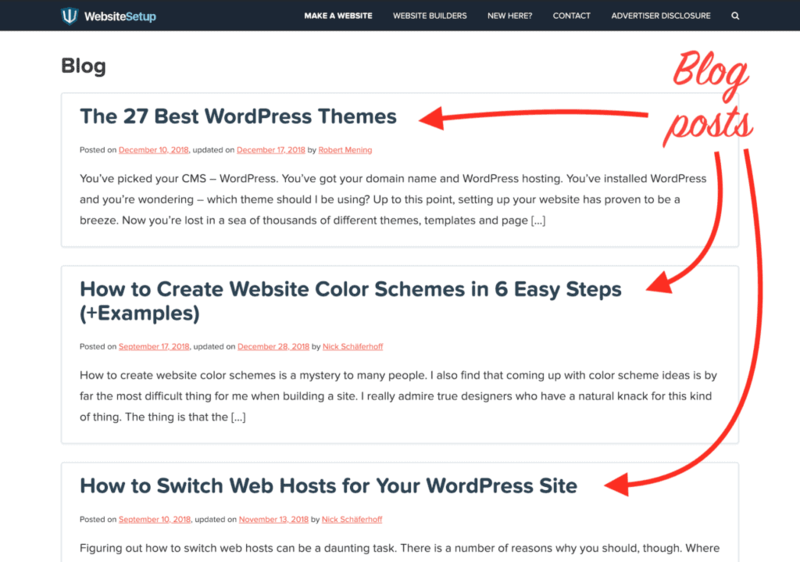 Instead, build your site on WordPress, and then decide whether you want to include a blog component later on. It’s a more future-proof solution than anything else. Alternatively, here are some other website builders if you are pretty sure that you’re not going to need a blog anyway. If you’re in a situation where you want to start an online business, then the question of blog vs website becomes even more critical. As experience shows us, blogs prove to be incredibly effective as tools for business. Hubspot reports that companies with blogs get 55% more visitors than companies with just standard websites. Having a blog gives you some specific benefits. Chief of them; search engines like Google simply love blogs. That’s because a blog, by definition, will always be more up-to-date than static sites, and will always have some fresh new content to show people. Google enjoys this sort of thing very much! Whenever you publish a new post on your blog, your website engine – WordPress – will ping Google automatically and invite them to come and index your new content. Static websites don’t give you this bonus. Having a blog also makes it easier to promote your business on social media. Think of it this way, if you only have a static website then what exactly can you share with your followers on social? The same web page containing your business’ description, over and over again? People will get bored pretty soon. In comparison, new blog posts are perfect for sharing with your people on social media. Since the content is always new, your followers will be more likely to check it out. The only downside to blogs is that someone has to be writing all this fresh new content for your blog. Therefore, a blog requires some ongoing time investment – you should aim to publish a new blog post at least once every two weeks, so be aware of that. Static websites, on the other hand, are often a one-time effort, which can be their advantage when we talk blog vs website. There are many ways to make money from your blog or website. I even compiled a list of 33 such ways here. As I said earlier, the most popular CMS – WordPress – has made its name for being able to run any type of blog or website imaginable, and this includes online stores as well! So to answer this quickly, yes, you can sell on your blog or website. If you’re on WordPress then you can start selling products after you install an additional plugin called WooCommerce. It’ll turn your blog or website into a fully-fledged e-commerce store. If you’re using another website builder, like Wix or Squarespace then you get an e-commerce store module right out the box. Yet again, the answer is yes. You can build a blog or a website all on your own, and you don’t even need any expert knowledge or skills to pull it off. The cost will depend on the website or blog engine/platform that you’ll use. If you decide to build your site with WordPress, you’ll need to get a web hosting account and a domain name before you can make your site operational. Simply speaking, web hosting is where your website or blog is housed. A domain name is your website’s address on the web. Though this might sound intimidating if you haven’t worked with hosting or domains yet, these things are actually pretty easy to deal with once you get to it. For example, buying a for-WordPress hosting plan from a company like Bluehost is as straightforward as it can be. All you need to do is sign up for a hosting account and pay the invoice (starts from $2.95/month). As part of the offer, you get a domain name for free, and Bluehost will also take care of installing everything – and then hand you over an operational WordPress website. All you’ll need to do is configure it by picking a WordPress theme and making your site look like you want it. Here’s our beginner’s guide to customizing WordPress. In most cases, WordPress is going to be a lot cheaper overall. Here’s a more in-depth look at how much does a website cost. Growth is probably very much on your mind, especially if you’re going to be launching your site for a business purpose. The good news is that the top-quality website and blog platforms don’t impede your growth in any way. For example, WordPress is used by some of the biggest brands on the web, including giants such as BBC, Wired, and even Beyonce. Quite simply, if it is capable of serving them, then it’s going to be able to serve your business as well. The only thing you might want to do once you start attracting more visitors is bumping up your web hosting specs to a higher tier – just to make sure that the servers can handle all the traffic. Apart from that, you can add as many pages as you want, as many blog posts as you want, and as many products as you want, and still be confident that it’ll all work without problems. I hope this has been helpful and that the topic of blog vs website is no mystery to you any longer. Having an online presence is vital if you’re running a business, but also a cool hobby to have as an individual.